Bring latest opportunities in your business by implementing business card maker software to design impressive business cards that can meet any type of business card designing requirements and needs. Business card designer software is devised with easy to use platform to design business cards having customized look and versatile features. Latest featured business card creator utility with use of wide range of card designing tools including Pencil, Text, Line, Ellipse, Rectangle, Picture and Star objects design stylish business cards just in few easy mouse clicks. Now it is possible to create and print proficient looking business cards in different shapes and sizes without requiring any professional business card designer help. Using easy, rapid and straightforward method, you can generate professional looking business cards in distinguish shapes including rectangle, ellipse and rounded rectangle as per your requirements. 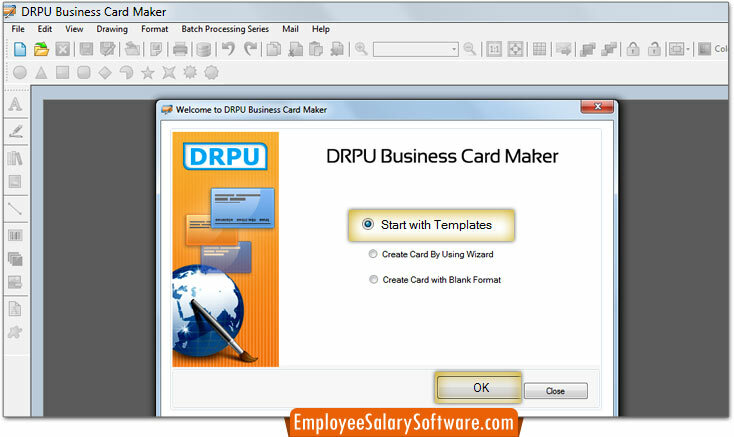 Business card maker software conveniently creates nice-looking business cards just in few simple mouse clicks. Specialist business card designer program has ability to design business cards in distinguish shapes and sizes. You can add photo, text, graphics and barcode during the business card designing process to design ideal business cards. You can design new business card or edit existing business card that is saved on your PC for later use. Technically advanced business card creator utility can design thousands of business card with different text value using expertise dataset series feature. Printing settings of business card maker software helps user to print created business cards. Advanced color and background settings aids you to create colorful personalized business cards.